Parents/Guardians will be informed of all school closures by the school authorities. To maximize their opportunities for learning students will attend school and all classes each day. Parents/Guardians should inform the school on the first day of absence. This initial contact should be made by phone directly to the school’s main office. Reasons for a student’s absence must always be communicated to the school in writing on the first day back after an absence. All notes should be written in the absence notes section at the back of the school journal. If for any reason a student has to leave the school early, written permission from a parent or guardian must be presented to his tutor during tutorial. The Principal or Deputy Principal must also sign this note and give permission for him to leave. The student must sign out in the book in the secretary’s office. Anyone feeling unwell should report to the office. A telephone call will be made home, where appropriate, to arrange collection. Students must not leave the college without permission. Students who leave the school grounds during the school day without permission may be detained to make up the time lost or suspended. Allstudentsmustleavetheupstairs areaofourbuildingatmorning breakandatlunchtime. Students are free to leave the school premises, unless the school management indicates otherwise, at lunch time only. Students who are absent for more than 20 days in the school year are referred to the National Education Welfare Board by the Principal and the parents / guardians are informed. The school day begins at 8.50am with class tutorial and students are required to be at their classrooms at the commencement of the school day. Late-coming interferes with the learning of others; therefore all students must be on time for all classes. Students who arrive late to school must receive a “late stamp” from the Principal’s office and be marked present on the EPortal system before going to class. Persistent lateness will be considered a serious breach of school rules and sanctions may be imposed. Failure to receive a “late stamp” may result in the school recording and reporting a student who has arrived late as “absent” and consequently a text may be sent home indicating your son is absent. A note of explanation should be given to your son or a phone call to the office if your son is late. If a student is late three times in any one week he will be placed on detention the following week after school. Parents will be informed. Students who display a pattern of late-coming will be required to attend an interview with their parent/guardian to attempt a resolution. The general presentation of students is important. You should, therefore, ensure that you are in complete uniform at all times while in school, travelling to and from school or attending any function as part of a school group, unless otherwise instructed. Extreme hair styles affect the image of students and of the school and are, therefore, forbidden. The school Principal is the judge in this regard. Piercings are not allowed and must be removed before entering school. The junior uniform includes a green jumper with the school crest, grey shirt, grey trousers, school tie, and fully black footwear. The senior uniform includes a navy jumper with the school crest, white shirt, navy/black trousers, school tie, and fully black footwear. If a written explanation is provided when a student is not in full uniform, replacement items of uniform may be loaned to students and must be worn. All students must wait, lined up quietly, outside the classroom until their teacher arrives. Students must sit in the seat given by the teacher. Do not presume to change your seat unless the teacher allows you. Students must follow all instructions given by the teacher especially with regard to work and behaviour. Pencil Case with Pens, Pencils etc. All specialist equipment including PE gear and materials as required by class teachers. Students who display a pattern of not having their equipment will be required to attend an interview with their parent/guardian to attempt a resolution. Students are not allowed to go to the toilets between classes. Students must get permission from their teacher to go to the toilet. This permission is recorded in the student journal. Inappropriate/bad language is disrespectful and is unacceptable in the College. Students will receive a verbal reprimand and an apology may be sought. Students may be detained or suspended. If the language or behaviour is abusive the student may be removed from the class or area and referred to Year Head, Deputy Principal or Principal. Parents will be informed. Detention, withdrawal from activities/trips outside of school and/or suspension is possible. If abusive comments are directed towards a teacher the consequences will be very serious and may result in suspension or expulsion. Students must have the school journal with them every day and have it available at all times for use by teachers. In it, they will record homework, material for study, class work, teachers’ comments, notes regarding absences, late coming and appointments. Homework, including written exercises, oral work, reading, research, learning and revision, is given on a regular basis and students are required to record it in their journal, complete it neatly, on time and to the best of their ability. Reading and revision should be done every night. A written explanation is required that day if a student has not completed all homework. Mobile phones, music players etc and use of technology. We acknowledge that many parents/guardians enjoy greater peace of mind about the safety of their sons when they are in possession of mobile phones. However some regulations regarding their use are essential to the smooth running of our school. Mobile phones and music players, including headphones, areserious distractionsinschooland mustbeswitchedoff and out of sight atalltimes other than break times. TheSchoolCommunityacceptsthatastudentmust handanysuchdevicetoamember of staffonrequest. The equipment will be given into the Principal/Deputy Principal’s Office and will be returned at their discretion. If there is an ongoing problem the phone/equipment will be not returned until a parent makes an appointment to collect it from the school. If a student continues to breach this rule the phone may not be returned to the student until the end of term or a student may be required to leave all devices at home. Students must accept the automatic sanction of the confiscation of the device without argument. Further sanctions may apply as per the Code of Behaviour. Parents/guardians who need to speak with their children by phone must do so through the school land line system. The use of recording devices, including cameras/video on mobile phones or other devices is strictly not permitted in the school or school grounds or on school trips without the prior consent of management. A serioussanctionwillapply if this rule is breached,includingstudentsbeingaskedto leavephonesetc.athomepermanently and possible suspension. Any student found texting or placing abusive or personal comments about their teachers or any staff member online will be severely dealt with. Students are not allowed use an image of a staff member/or another student in any way without permission. As part of our efforts to promote healthy eating these drinks are not allowed in the school at any time. Students must hand over such drinks to any member of staff on request. Failure to do so will result in sanctions. The possession, use or distribution of alcohol, tobacco or illegal substances while in school or on school outings are not permitted and will result in serious sanctions. Smoking, including electronic smoking devices, is strictly forbidden throughout the school and its vicinity and on all school trips. Any student found to be in possession of, using, under the influence of or supplying illegal substances will face very severe consequences. The school will inform the parents and the Gardaí and will advise parents on where to access professional help for their son. In almost all cases expulsion of a student in this situation will be considered by the board. The possession of bangers /fireworks/sharp objects or items that may injure another will be treated with the utmost of seriousness and may involve informing the relevant authorities. Bullying, fighting and intimidation are regarded as the most serious discipline offences that can be committed and will not be tolerated. Suspension and or expulsion may result. Conduct outside of school hours may be of interest to school authorities. The Code of Behaviour applies fully to all activities, trips etc. taking place under the control of the college. Students are, if chosen, expected to participate in all college activitieswhether or not they fall within the school day. Whilst the school expects that students will comply with the Code of Behaviour both within the school and within the school day any behaviour outside the school and/or school hours that damages the school, interferes with its workings, is detrimental to other students or undermines school discipline or good order may be subject to the school’s sanction, and/or may be referred to such other authorities as appropriate. Students’ conduct on the way to or from school is as important as within the school. Students are reminded to behave in a mannerly way on the road, in shops, at the bus stop or in the bus etc. Complaints about students’ conduct outside of school will be acted upon. We are very proud of our wonderful school building/campus and we view anyone damaging the building or its contents as very serious. Any student involved in defacing or damaging school property may receive a note in their journal and may be required to pay the cost of repair or replacement. Students will be required to clean off graffiti. While every reasonable precaution will be taken, the School Management accepts no responsibility for loss or damage to a pupil’s property. School insurance does not cover such loss or damage. Bicycles should be securely locked to the bicycle racks in the bicycle shed. Please note that we accept no responsibility for cars (or their contents) or bicycles on the school premises. Large sums of money and valuable items should not be brought to school. Sanctions form a part of positive intervention. The purpose of a sanction is to bring about a change in behavior by helping students to recognize that their behaviour is unacceptable and of its effect on others. It may also help them to take responsibility for the actions and allow them to understand that all choices have consequences. A firm verbal reprimand from the staff member as they deem fitting is expected to be sufficient to correct inappropriate behaviour. The staff member may impose a sanction or use an appropriate classroom management strategy at this point. A note in the journal or a removal of privilege may be appropriate at this stage. The students should be warned that they may be given a Scale 1 if the inappropriate behaviour continues. Sanction one is given for minor misbehavior. The emphasis is on the move into the school disciplinary system rather than on the length of the punishment work or on the type of sanction. (ii) for an incident more serious than would warrant Sanction1. (i)Name of student (ii) Class (iii) Date (iv) Reason for punishment (v) Teacher’s signature. The teacher keeps a copy and gives a copy to the year head and the top white sheet to the student for parental /guardian signature. This is a very serious step in the Code of Behaviour and represents severe misbehaviour. Temporarily removing a student from the classroom to a supervised location may be appropriate in the interests of classroom management in order to ensure the learning of other students and to help the individual student to recognise and learn about the impact and consequences of their behaviour. Teachers will fill out a detailed report on any student removed from class and present it to the relevant year head on the day of the incident. Additionally, all teachers complete a record of what has been done to date in an attempt to improve the student’s behaviour. A Report Sheet is used when the matter is so serious it needs to be brought to the immediate attention of the Year Head/Deputy Principal/Principal. It should be noted that if the behaviour of the student does not improve the Deputy Principal/Principal will take whatever action is appropriate, up to and including recommending expulsion to the Board of Management. A year head/Sli Eile Behaviour Support teacher may put a student on Report Book for a week if the year head decides that there are persistent discipline issues or on return from a period of suspension. The Year Head gives him his report book on the first school day of this week or on return from suspension. 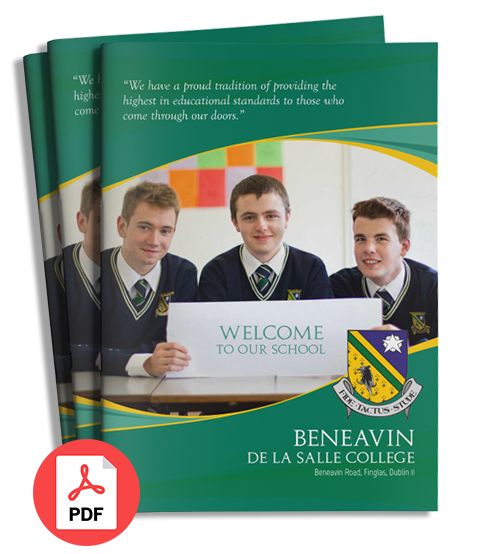 The purpose of the Report Book is to monitor closely the behaviour of a student and record positive as well as poor behaviour. Parents/guardians are asked to sign the book. Conduct/Target Report Books are retained in the student’s file by the year head/Sli Eile. Detention must be regarded by all concerned as a very serious stage in the Code of Behaviour. Detention may be given for a once off serious misbehaviour or a pattern of poor behaviour as evidenced by an accumulation of Sanction 3s over a short period. Parents/Guardians will be informed in advance of a student’s detention. Students who continue to come to the attention of the Year Head, Deputy Principal or Principal through unsatisfactory behaviour may receive a suspension warning letter to bring home to their parents. This is to make clear that a change in behaviour is essential to avoid further disciplinary action. a)2 Sanction threes during a Report period. b)An excess of unfavourable comments in the Report Book. c)For more serious misbehaviour or the student having been referred to the Principal/Deputy Principal for a serious incident (e.g. abusive language towards a teacher / defiance / persistent misbehaviour / bullying / violence / damaging property /substance abuse / failure to attend detentions or other misdemeanors regarded by the Principal as being serious enough to warrant suspension). Suspension by the Principal will last for up to three schooldays. Parents will attend a meeting in the school, be given a Letter of Notification of Suspension and be informed that they have a right to appeal this to the Board of Management. They, along with the student, are advised of the next stage of the code and they sign an appropriate document guaranteeing future behaviour. A student will not be suspended for more than three days, except in exceptional circumstances where the Principal considers that a period of suspension longer than three days is needed in order to achieve a particular objective. Where a suspension longer than three days is being proposed by the Principal, the matter will be referred to the Board of Management for consideration and approval, giving the circumstances and the expected outcomes. However, the Board of Management do authorise the Principal, with the approval of the Chairperson of the Board, to impose a suspension of up to five days in circumstances where a meeting of the Board cannot be convened in a timely fashion. In cases where a student’s continuous poor behaviour/ minor breaches of discipline has adversely affected the capacity of the school to teach that student and/or teaching and learning in classroom(s) and/or maintaining good order in the school, this may have the effect of a student receiving a series of sanctions for indiscipline. Following consultation with the teachers and in what the Principal considers being exceptional circumstances, a referral to the Discipline Committee may be considered to afford a measure of flexibility to the Code of Behaviour. The committee comprises of a Year Head, a member of the school’s Care Team, the Principal and/or Deputy Principal and a representative/nominee of the Board of Management. This review will be conducted in the presence of the parent(s)/guardian and student and they will have an opportunity to respond. The student’s behaviour and possible plans that could be put in place to improve it will be discussed. The committee will then decide on the next appropriate step the school should take. All options with reference to the school’s Code of Behaviour are open to this panel and shall include the opportunity to directly refer the matter to the Board of Management through the Secretary of the Board. The Board of Management may request a meeting with the parent(s)/guardian and the student to review the student’s file. Expulsion will be considered by the Board of Management only after every effort at rehabilitation has failed and every other sanction has been exhausted or for a single serious incident. The successful education of all students depends on a strong link between the students, their parents and the school, each one having rights and responsibilities. To treat all students and staff within the school community with respect. To respect all school property and the property of my fellow students. To be on time for school and all my classes. To attend school every day where possible. To wear my school uniform at all times. To bring all books and equipment to class. To bring my school journal to all classes. To complete all homework and present it on time. To allow my teachers to teach and my fellow students to learn. To encourage my son to attend school every day and to be punctual. To check my son’s journal each evening and to sign any notes from his teachers. To ensure that my son has completed all of his homework. To support the school, its teachers and its policies. To encourage my son to work to the best of his ability. To sign my son’s journal once a week.